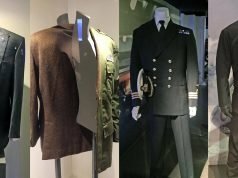 Pierce Brosnan’s navy cashmere double-breasted overcoat that he wears over his grey pinstripe suit in Die Another Day is the last tailored piece of James Bond’s wardrobe this blog has left to cover before the clothing in Spectre is revealed. 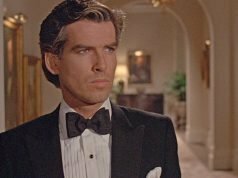 Pierce Brosnan wears at least one overcoat in every one of his Bond films, and this is his third double-breasted overcoat after the vicuna-coloured overcoat in Tomorrow Never Dies and the funereal black overcoat in The World Is Not Enough. The navy Brioni overcoat is full-length to just below the knee and has six buttons with two to close. The lapels are peaked with a buttonhole on both sides. The overcoat has a half belt in back attached only at the ends, a long single vent, four buttons on the cuffs and straight, flapped pockets. Bond wears the collar up, which keeps the wind off his neck and reveals the navy velvet undercollar. Though full-length overcoats are not very popular right now—shorter coats are trendy and are almost all that’s available currently—they look the most elegant of all overcoats and keep the body the warmest. Double-breasted overcoats are warmer than single-breasted overcoats due to the extra layer in front. Bond, however, doesn’t benefit from the warmth of his overcoat since he wears it open. It must not be that cold. Or, perhaps like his grey suit underneath, the overcoat has become too tight to button. London, where Bond wears this coat, ocassions has very cold winters, and the warmth of a double-breasted coat is very beneficial whether the winter is severe or mild. With the overcoat, Bond wears dark brown leather gloves with three points sewn on the back of the hand. The gloves are sewn with the seams on the outside, which are more comfortable than seams on the inside but are also more prone to wear. The gloves have a V-shaped palm vent to ease the glove onto the hand. Beautiful coat. Like all of Brosnan’s tailored clothing worn as Bond this looks rich and luxurious. I particularly like the touch of the half belt at the back. The only caveat I have with Brosnan is this unfortunate tendency to leave double breasted coats and jackets open and I suspect this is motivated by a feeling that this is fashionable, the rocks on which so many sartorial outings flounder! I completely agree with you except for one thing : I think it looked sloppy with the blazer of Goldeneye only. With the overcoats, he pulls it off quite well. Although I admitt Brosnan could have looked great in a (closed…) Brioni DB suit, it’s a pity then didn”t make him wear a DB at least once for a change. Last James Bond related post before SPECTRE? This is officially a working archive of James Bond clothing. Read closer. It’s the last tailored piece I have to cover. There are plenty of other Bond-related things I can write about, including casual and sports clothes, and tailoring details. Oh, okay, tailored. And, I meant the “archive” as a compliment. If anyone ever needs to know about James Bond’s clothes, this site should be the first and only stop. 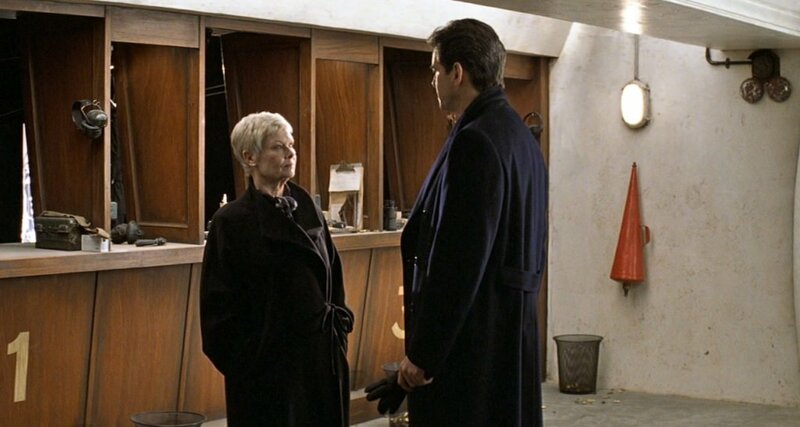 Brosnan’s Bond most beautifully tailored overcoat, my favorite. I have been waiting a lot for this one ! Thanks for covering it, Matt ! If I’m not mistaken, it is a beautiful example of the Guards Coat. This type of coat is also called in Italy “Doppiopetto Italiano (“Italian double breasted”) because is the more common type of classic overcoat in Italian bespoke. I think that “doppiopetto Italiano” is simply a more soft version of the “guards coat”. What exactly makes this a “gaurds” coat? Everything! It’s the perfect example of a guards coat. Beautiful coat. And for once, the sheer obvious luxury of the Brosnan years’ clothing doesn’t bother me. I agree with the comments from David and Le Chiffre. Again an informative post and comments. And I look forward to more (Mathis, the Leiters, casual clothing, awards shows, anything) between now and SPECTRE. Thanks Christian/le Chiffre. If a DB jacket or coat was meant to be worn open then it wouldn’t be constructed in the way it is. Brosnan has, overall, a natural sartorial savvy and it always surprised me that this escaped him. Another comparison post would be teriffic and in relation to the sportswear Matt mentions, Lazenby’s outfit which he wears to return and destroy Piz Gloria is surely a certainty soon given OHMSS’ Christmas/New Year timeframe? For those of us who laymen in this sort of sartorial garb please fill in the details as to what exactly makes this a guards coat as opposed to a normal overcoat? I provided the description of the coat in the article. It’s these main details in particualr: The navy Brioni overcoat is full-length to just below the knee and has six buttons with two to close. The overcoat has a half belt in back attached only at the ends, peaked lapels, a long single vent, and straight, flapped pockets. Matt, is it only the half-belted back (and perhaps the lack waist suppression) that distinguish a guards coat from a double-breasted Chesterfield coat ? The half belted back is the main difference. Both the guards coat and the chesterfield have some waist suppression. The chesterfield usually has a velvet collar whist the guards coat does not. Well done, Matt. You’ve done! That’s quite an achievement, reviewing every piece of tailored clothing Bond wears, plus countless more. Have a martini on us. Matt, why is this called a Guards coat but Moore’s in LALD is a Chesterfield? The two major differences I see are I) velvet collar in latter and II) back half belt in former. And from what I see, the velvet is optional and not mandatory with a Chesterfield. They are both double breasted and similar. And to add to the confusion, there is also a Paletot…how is that different? So all these coats seem pretty similar to me. And if the back belt is adjustable and the front pockets are patch, it becomes a “Polo” coat? The guards coat is essentially a chesterfield without a velvet collar and with a half belt. It may button two (like this example) or three, whereas the double-breasted chesterfield always buttons two. Paletot is the same as a chesterfield. 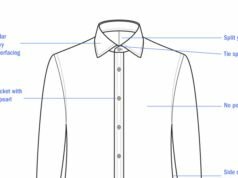 The Polo traditionally has an ulster collar rather than peaked lapels, though the latter are also common. I wonder why he wears brown gloves with this suit and overcoat. His shoes and belt are black, aren’t they? Gloves do not need to match the shoes. Black gloves are best saved for the evening. I see. I didn’t know! A beautiful overcoat. Seen in many photos of well dressed gents in the interwar period but not so common after WWII due to clothes rationing and then postwar, for a very modest sum, a man could get a greatcoat (like that worn by Moore in TSWLM) from a military surplus store. If you were lucky, you could get a coat which had never been issued. It would look better fastened, of course, but it could be a gesture to show that Brosnan is constantly mindful of pistol access. Would this be a Brioni stock item or something run up by them to Lindy Hemming’s request? Either way, a superb winter coat. Where can one buy this wonderful coat? A bespoke tailor may be the only place to get such a coat today.